As a result, she said LocalOn’s initial efforts were “a complete failure” because “nobody wanted to hear from us.” Then she and her co-founder David Tolioupov came up with a better way to reach those businesses — working with local newspapers and merchants associations. The approach seems to be working for the startup, which is part of incubator Y Combinator’s current class of companies. It has already partnered with 40 merchants associations and two newspapers in the Bay Area — apparently the partnership has generated $50,000 in new business for the East Bay Express newspaper over the past six months, and the OaklandGrown merchants association has seen a 20 percent increase in revenue from annual memberships. So what is LocalOn asking these groups to sell? Well, Imran seemed particularly proud of its website builder, which is part of a wave of new services (such as Barley) designed to make it as easy as possible to build and edit a website. She gave me a quick demo of the LocalOn editor, which allows businesses to edit their site just as they would edit a presentation or document, with the changes going live immediately. It’s also easy to push new updates about events and deals to the site, which are automatically posted to social networks and local listings as well (that’s another way LocalOn’s partnerships come in handy). And there’s support for e-commerce. 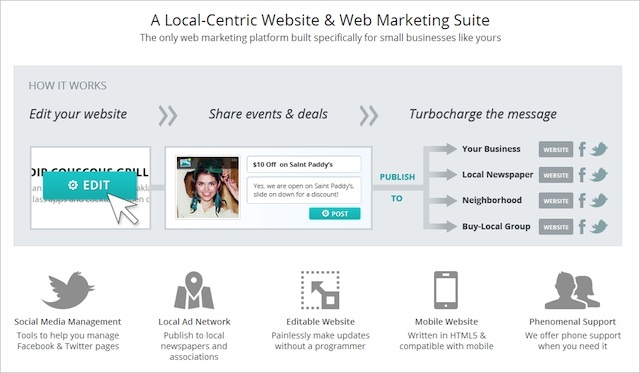 LocalOn offers tools for merchants associations and newspapers too, including website hosting, a member directory, member billing, and a widget where real estate agents can submit listings for vacant properties — so the organizations are be both resellers and customers. Looking ahead, Imran noted that there’s a growing number of interesting local products on the LocalOn platform, so the company could eventually work with its media partners to create interesting aggregated shopping experiences. Update: An earlier version of this article incorrectly stated that LocalOn’s products can be white labeled (i.e, resold under new branding).